Synopsis: Jihadist ideology inspires a diverse and decentralized collection of radical groups to fight alleged enemies of Islam and to attempt to "restore" a holy caliphate to unite Muslim peoples across the Middle East, Africa, and Asia. 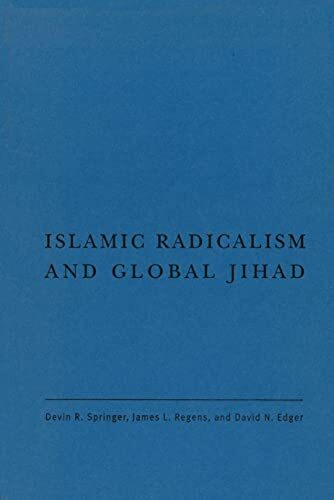 Islamic Radicalism and Global Jihad provides unique insights into the philosophical foundations, strategic vision, organizational dynamics, and tactics of the modern jihadist movement―with specific attention to its primary driver, Al-Qa'ida. Springer, Regens, and Edger draw heavily on Arabic language sources seldom seen in the West to explain what jihadists want and how radical thinkers have distorted the teachings of Islam to convince followers to pursue terrorism as a religious duty. With sophisticated and systematic analysis, the authors lead their readers on a fascinating intellectual journey through the differing ideas, goals, and vulnerabilities of the jihadist movement as it has evolved over time. The authors also impart wisdom from their own professional experience with terrorism, counterinsurgency, and intelligence to provide scholars, students, counterterrorism professionals, and general readers with this accessible overview of key radical Islamic thinkers and today's jihadists. About the Author&colon; Devin R. Springer is a research associate in the Center for Biosecurity Research at the University of Oklahoma Health Sciences Center and an Arabic linguist. James L. Regens is presidential professor and founding director of the Center for Biosecurity Research at the University of Oklahoma Health Sciences Center. He has served in senior government positions and on review boards for the International Atomic Energy Agency, the Defense Threat Reduction Agency, and the Department of Homeland Security. David N. Edger is a visiting professor at the University of Oklahoma Health Sciences Center and a faculty member in the Department of Political Science. He also spent 33 years in the Central Intelligence Agency where his most senior position was head of operations of the Clandestine Service. Springer, Devin R./ Regens, James L./ Edger, David N.